How on earth had Thomas Duffy's life become stranger than a tabloid headline? One moment he was a grumpy-but-respectable country doctor. The next he was starry-eyed over an exotic beauty who'd dropped out of the sky and into his wheat field. If Thomas didn't protect Janella, those sinister government snoops might harm her. So he did what any chivalrous gentleman would do: he married her. Thomas never imagined that Janella had been waiting for him, long before they met. 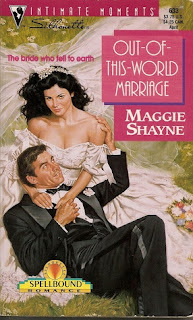 Or that his new wife expected the works: wedding night, honeymoon - and love. This was a fantastic read. You can definitely tell it's an older book, yet it aged pretty well. I really enjoyed the prologue which set this up as a thing that's been happening since he was a child. This was a very fun story because in Janella's world women are the rulers and even though she didn't like the world she kept expecting humans to be the same and was aghast when she discovered it wasn't the same. I loved that she adapted so well to being on Earth, even if she didn't give herself an out if she had landed here and he'd already gotten married what would she have done?? When Thomas was a child he saved Janella and then he does again as an adult, and she also saves him, but that time takes longer. I absolutely loved how the relationship developed between them and how each of the characters grows as the story progresses. I absolutely loved how Janella grows within this new world, yet she pins so much of her hope on Thomas being a good guy, Thomas is very afraid after seeing so much death and isn't sure how to view her belief in him at times. I loved that this was character driven and yet we had a bit of a mystery about the men from the government, and the refugees from her world. As the story unfolds and their emotions become more entangled that we realize that much of their drama comes from simple miscommunication. I enjoyed the discussion of what is an alien and how do they differ from us and what do they bring to the table. Female friendship is a big theme in this one as well and having a mentor who helps to guide Janella even if she doesn't know the full story she sees more than even Thomas expected. I just loved this story and the world we were introduced to.